So this is starting on the wrong foot. I wholeheartedly thought St. Patrick’s Day was on Sunday and not Saturday. Last year, I was celebrating St. Patrick’s Day in Dublin and truth be told, the parade was nothing to cheer for. However, Irish coffee is. I’m not really a coffee drinker, I need sugar, milk and sometimes chocolate or booze. Might still be a teenager in that department. But regardless if you’re a coffee drinker or not, I believe you are going to love this! It’s just the right amount of bitter from the coffee, and it goes so well with the sweet brown sugar and a little zing from the whiskey. Top it off with a velvety almost pourable cream, and it’s a really nice dessert. 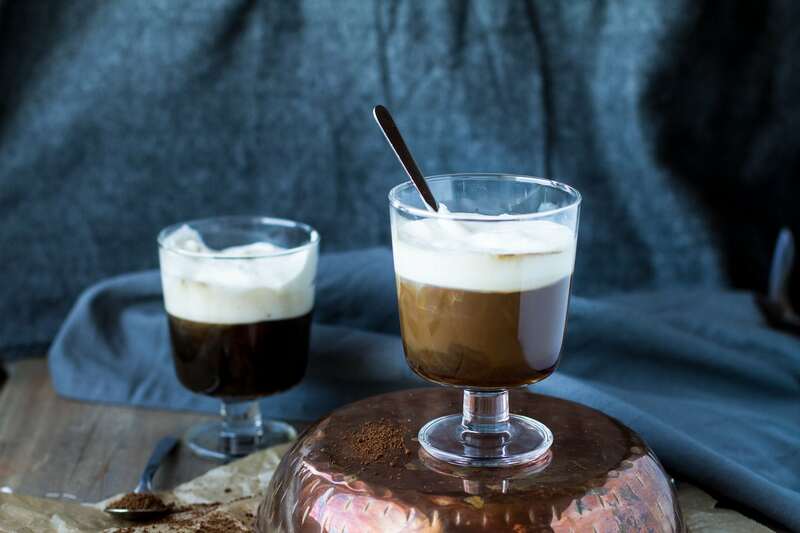 Celebrate St. Patrick’s Day in the comfort of your own home and enjoy this comforting hot coffee drink. 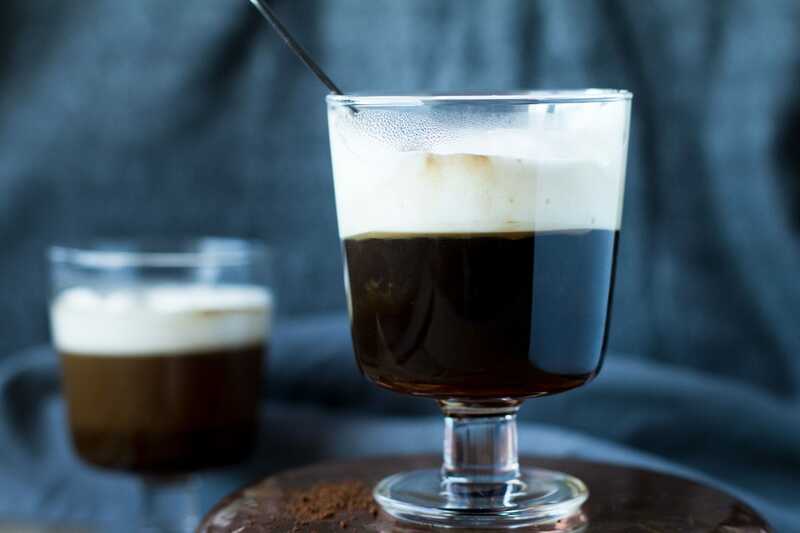 I know there are a lot of Irish coffees out there that has so much more alcohol than this one, and that’s what I love about it! Too much alcohol just tastes like cat’s piss to me, and it does no one any good. I want a little, just to break the bitterness and tie it with the sweetness. This is perfect. Of course, you add more or less whiskey and sugar to your own liking, this is just my preference (however, I might add even more sugar the next time, but don’t tell anyone). And one more thing about Dublin and/or Ireland; does anyone really understand what they’re saying?? I had such a hard time understanding their English – immensely thick dialect! So eventually, we just faked a bad hearing, because you know, it was kind of embarrassing. But, we had a blast anyway. You should be using an Irish whiskey because they have good whiskey, and it’s an Irish Coffee duh. However, I’m guessing you have a favorite brand, and rest assured, you can use it. I used the Irish Jameson whiskey. Whiskey might be one of my favorite drinks, apart from mojitos of course. Nothing can beat a good mojito! However, a whiskey sour is pretty high on my list. Totally going to experiment and make the perfect whiskey sour. 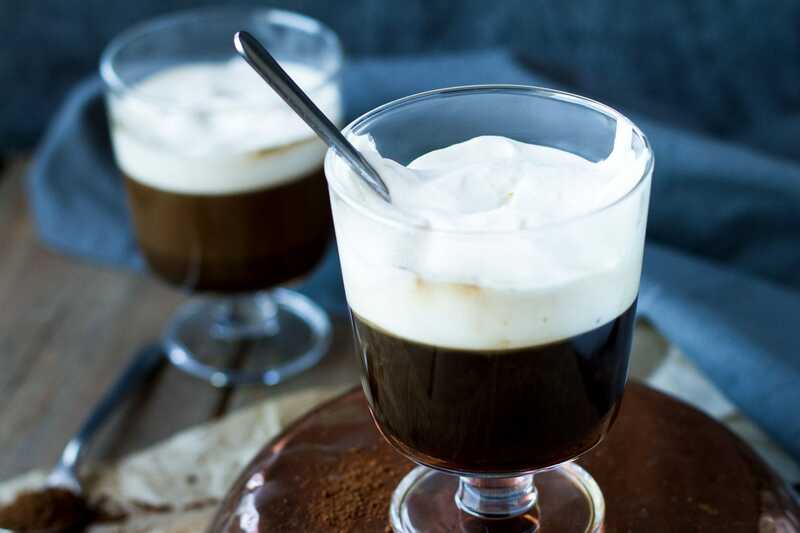 But I digress, today is all about the Irish Coffee. 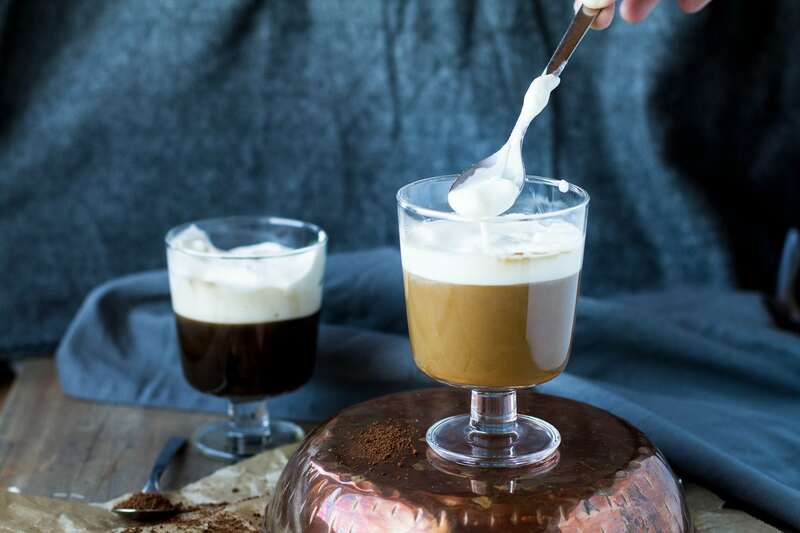 This Irish coffee unites all the coffee drinkers, booze lovers and sugar addicts into a cup of perfection. You want the secret? It’s all in high quality coffee (great list of high quality coffee brands) and the cream. The cream should be just whipped, so just slightly starting to become whipped. It should still be pourable, but a little thick. This makes it possible for the coffee to come through and not just having a thick dollop of cream floating on top. You can se what I made in the photo below. Add hot water to your mugs and let it sit for a few minutes to heat them up. Pour it out and add in the high quality coffee. Stir in brown sugar and whiskey and it’s ready for the cream. Take a spoon over the mug and pour the thick, pourable cream at the back of the spoon. This way the cream will stay on top of the coffee, and it’s liquid enough for you to reach the coffee and not just the cream! How genius is this! I’m totally giving this a try on hot chocolate too. It’s always been an element of irritation that the cream just floats and is impossible to get to. Perfect. Hope you’ll enjoy this classic yet delicious Irish whiskey! And if you want to really up the game and celebrate Ireland tomorrow, I suggest whipping up a batch of these Chocolate Coffee Cupcakes with Irish Baileys Frosting for dessert. I’d love to hear your thoughts, either in the comment section below, or tag me @thegingerwithspice on Instagram. Don’t forget to Pin it for later! 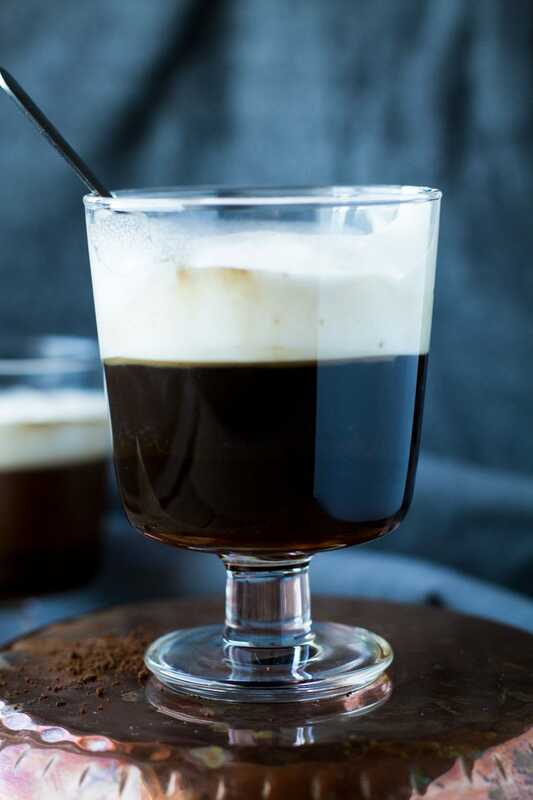 A classic Irish coffee where bitter coffee and sweet brown sugar are tied together with a little zing of a good whiskey. 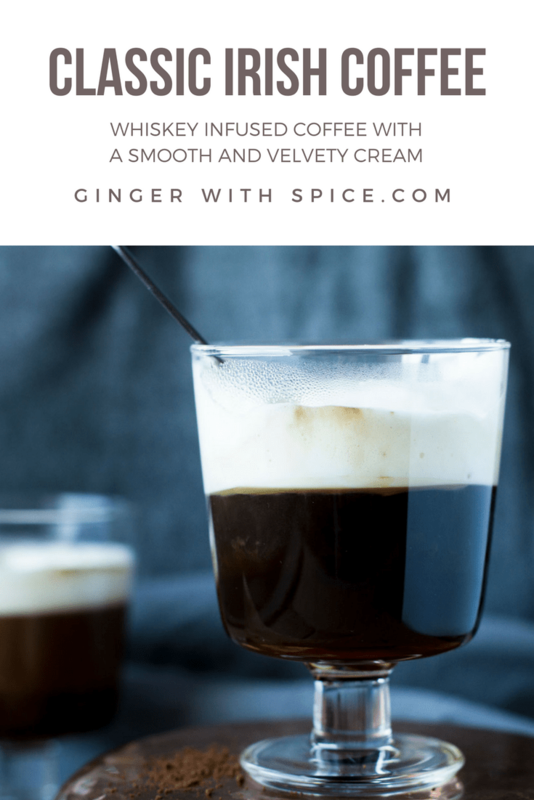 Topped with smooth and velvety cream, enjoy! 200 ml black coffee 8 oz. Add hot water to your mugs and let it sit for a few minutes to heat them up. Pour it out and add in the high quality coffee. Stir in brown sugar and whiskey and it's ready for the cream. Whip the cream: The cream should be just whipped, just slightly starting to become whipped. It should still be pourable, but a little thick. This makes it possible for the coffee to come through and not just having a thick dollop of cream floating on top. Take a spoon over the mug and pour the thick, pourable cream at the back of the spoon. This way the cream will stay on top of the coffee, and it's liquid enough for you to reach the coffee and not just the cream. This looks great, i might add a touch more Jameson but i agree. too much tastes HORRIBLE in an Irish coffee. I used to be a big coffee drinker, but now I drink coffee probably once a week. I would love to try this but I would like the virgin version, 🙂 will that take the Irish out of it? Thanks for sharing! 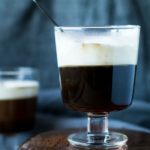 I LOVE Irish coffee but have never made it at home! Definitely going to change that! I could sit through any 3 hour parade if I had one of these in my hand! So yummy! This looks absolutely fantastic. I am a huge coffee lover and enjoy it in just about any form. Thanks for sharing this! Thank you, Constance! I hope you’ll like it! Maybe you’ll like the Chocolate Coffee Cupcakes with Baileys Frosting too! Chocolate and coffee is such a great combination, in my opinion. 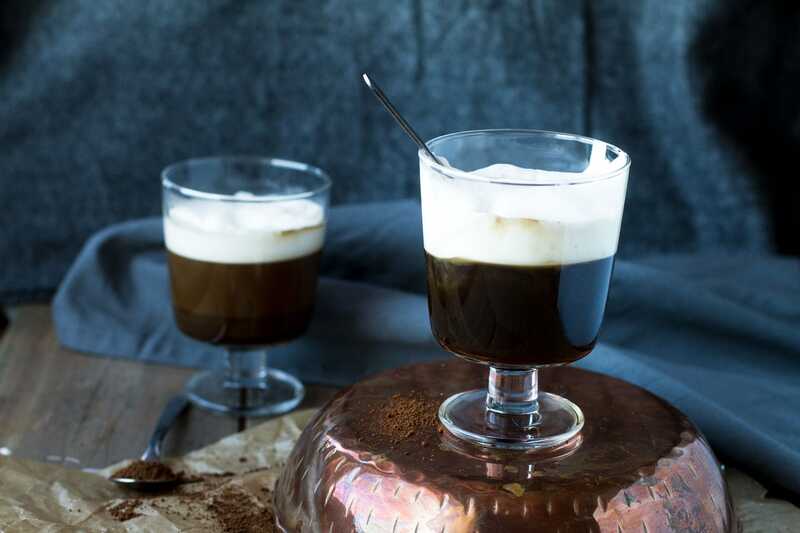 Oh my, I don’t think I’ve ever tasted an Irish coffee as gorgeous as this one! It looks so perfect and creamy! It looks so good. I only drink alcohol for a special occasion. My go-to drink is the chocolate martini. I don’t see why I couldn’t sneak in Bailey’s Irish cream on my coffee every now and then. Thanks! Thank you so much! I don’t either, but this makes it a little (too) easy to drink alcohol. I love Baileys with coffee, and a chocolate martini also sounds delicious.